Delphinium plants can be either hardy or half hardy perennials. Delphinium are very variable in height depending on the variety and can grow from anything from 15 cm to over 2 metres in height. They bloom with tall spires with flowers of blue, pink, purple, yellow or white. The timing of flowering is variable between species of Delphinium, and can be anything from the end of spring to autumn. Tall Delphiniums photograph by cacophonyx. Common Names: Larkspur, Delphinium, Forking Larkspur. Height: 4 to 80 inches (10 to 200 cm). Flower Details: White, blue, purple, yellow, pink. Spurs. Raceme. Sepals resemble petals. Sow Outside: Cover seed. Start of spring or the beginning of autumn. Spacing: Smaller species 8 to 18 inches (20 to 45 cm); Larger species 24 to 40 inches (60 to 100 cm). Sow Inside: Germination time: two weeks to one month. Temperature 50 to 55°F (10 to 12°C) in the dark. First mix seeds in a moist growing medium, place in a freezer bag, then stratify by refrigeration for two to three weeks. Sow stratified seasons about two months in advance. Transplant outdoors early in spring or autumn. Requirements and care: Full sunlight or light shade. Soil pH 5.5 to 7.0. Good drainage. Deep soil, rich soil. Regular watering when plant is growing. Provide an early spring feed. Following first bloom remove faded flowers. Supply a further feed. Provide support for taller varieties. Cut back old growth when new growth reaches about 9 inches (27 cm). Propagate: by dividing in the spring. Miscellaneous: Attractive to Bumble bees and moths such as the Small angel shade. 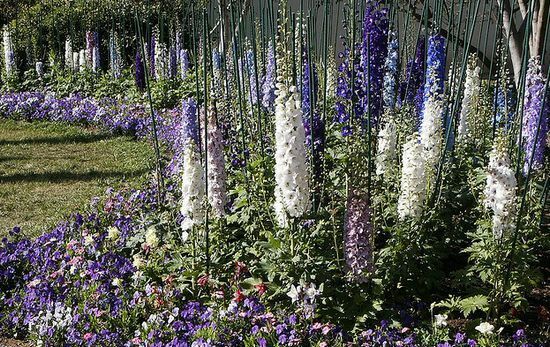 When growing Delphinium outdoors from seed they should be sown either at the beginning of spring or the beginning of autumn; simply cover the seeds with topsoil. The spacing will depend upon the variety (small species about 40 cm apart; large ones about 80 cm apart). They can grow in either a sunny or lightly shaded area of the garden that has good drainage. The soil should be rich, deep and have a slightly acidic to neutral pH of 5.5 to 7. Once growing Delphinium should be fed with fertilizer at the beginning of spring. 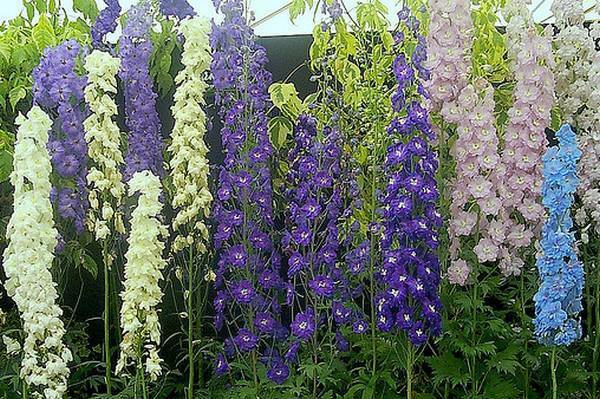 Taller varieties of Delphinium should be staked. As soon as the first bloom is over the flowers should be cut off; this will result in further growth; once the new growth has reached about 20 cm then the old growth should be pruned off. If you require more Delphinium plants then they can be propagated by division; this can be carried out in the spring.